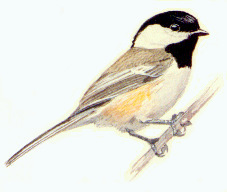 Biology - The chickadee feeds on insects, seeds and berries. They prepare their nest with grass, fur, plant down, feathers and moss in a hole in a rotten tree stump, a natural cavity or a bird box. This bird is constantly active, either hopping, clinging or hanging from tree branches. Description: Wood wren/chickadee house with a 1" entrance hole features proper ventilation, drainage, and a clean out door. Screwed construction, pre-drilled holes, packed in a poly-bag. Shown assembled. Wrens, chickadees, nuthatches, titmice--this little beauty is beloved by all your favorites, and with reinforced front you'll never have to worry about unwanted guests. Select cypress construction with Heartwood's special hand-cut and stone-washed shingle roof gives it exceptional style; copper covered cleanout door and metal hanger make for exceptionally easy maintenance. Sold in a 5-pack, one each of these great colors: whitewashed, pinion green, redwood, smoke gray and celery.